After Supermom is finally done for the day she needs some well-deserved rest and relaxation. These silk pillow cases are just the trick. Not only will sleeping on a silk pillowcase give her an all-around improved night sleep, but also helps with great hair and better looking skin. The smoothness of Shhh Silk will make sure her hair glides preventing split ends and hair breakage. Also, available in 6 different color ways, so any case will fit Mom's bedroom aesthetic. To make the gift a good night sleep a little more personal, you can add your mom’s initials for a small fee! Give your Mom the gift of a restful sleep with The Hollywood Silk Solution! This is Hollywood's best kept secret and now Mom can enjoy the luxurious feeling of sleeping on Silk. 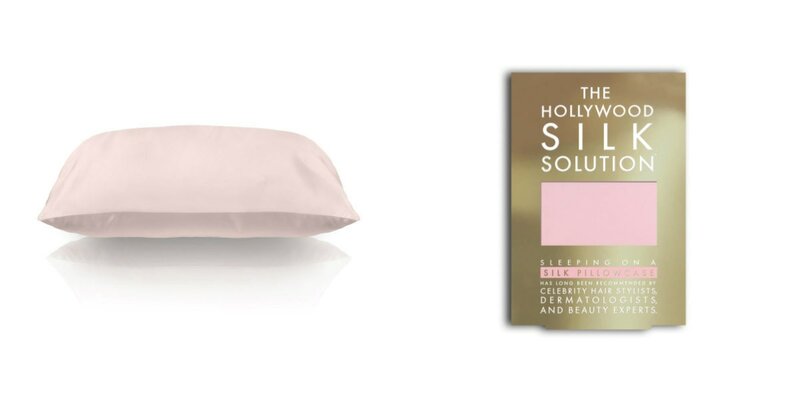 The benefits of sleeping on The Hollywood Silk Solution compared to sleeping on a standard cotton pillowcase is that silk helps to reduce tugging on delicate facial skin, reduces those annoying face creases, reduces bedhead and extends Mom's blowout! ​Keep your Mom looking youthful and gorgeous with a slip pure silk pillowcase! Cotton pillowcases grab hair and twists it at the root throughout the night, damaging hair and causing bed-head in the morning, whereas slipsilk™ is so gentle on hair, it allows for a hairstyle/blow-dry to last overnight. Unlike cotton, which draws moisture from your face, hair and scalp, slipsilk™ breathes and is a natural temperature regulator. This is the perfect gift that your Mom will love! ​Give Mom a comfortable sleep with the Dreampad Memory Support Pillow! This pillow is unlike no other and provides the gentle firmness of a memory foam material. Made with quality materials, your Mom will have amazing comfort with excellent support! For a Mom that loves to decorate, ​the Wolfum Olga Black Metallic Quilt is the perfect gift! This ​100% cotton twill quilt is perfect for her bed or as a stylish throw on the couch! The quilt is machine washable and made in the USA. The black and metallic gold is elegant is a perfect gift for Mom! ​Does your Mom have trouble sleeping? If so, the Sound Oasis Illumy Sleep & Wake Mask is the perfect gift! The comfortable Sleep and Wake Eye Mask helps you fall asleep faster with gradually dimming sunset lights and wakes you gently with “blue sky” morning light before your scheduled alarm. For stubborn insomniacs, optional Sleep Enhancement® technology helps nudge users to sleep with pulsating lights that match the brain’s own Alpha and Delta frequencies. The mask programs easily with a free app for your mobile device and is compatible with Andoriod and IOSs devices. Give Mom the ultimate in relaxation with the ​HoMedics® Comfort Pro Elite Massaging Vibration Wrap with Heat! This wrap delivers a vibration massage to loosen Mom's tight muscles. The soothing heat provides comfort for tired muscles, while the soft, plush fabric envelopes Mom for luxurious comfort! Surprise Mom with the perfect massage everyday! The HoMedics Perfect Touch Masseuse App-Controlled Massage Cushion with Heat delivers an intense, invigorating full-back massage along with deep neck and shoulder massage. The cushion comes equipped with a mobile app that Mom can download and use on her smartphone to operate the cushion and create her own massage programs! Mom can also use the programmed controller, which allows her to select three different massage zones and spots. Mom can also use heat to intensify her massage. This is the perfect gift for Mom that will provide the ultimate in relaxation! ​Brighten your Mom's smile with the The Mouth Watchers Power Toothbrush! This powerful toothbrush offers a unique 3D Action while the revolutionary antimicrobial* dual layer flossing bristles reach into areas untouched by prior toothbrushes for a deep cleaning! The gentle oscillations leave teeth and gums feeling just as clean as after a professional dental cleaning.The revolutionary Flossing Bristles™ operate at 5,000 oscillations per minute with up and down motion. This is the perfect gift to keep Mom's smile look beautiful! Give your Mom piece of mind with the TubShroom! Mom will never have to worry about clogged drains as Tubshroom saves the day by effortlessly catching human and pet hair in your bathtub without disrupting the flow of water. With easy installation, the TubShroom fits any standard bathtub drain with a snug fit! Give Mom the gift of powerful cordless cleaning with the Bissell AirRam® Cordless Vacuum! Equipped with a professional-grade, 22V lithium ion battery, this high-powered, cord-free vacuum delivers up to 30 minutes of powerful suction across carpets, hard floors and area rugs. The vacuum's ultra-light design with swivel steering easily maneuvers around and under furniture for maximum cleaning. Mom can enjoy a faster and easier way to vacuum the entire home with the powerful, cordless freedom of BISSELL® AirRam®! ​Looking for a gift that your Mom will love and is useful? Look no further as the artnaturals Bluetooth Oil Diffuser is the perfect Mother's Day gift! The Bluetooth Oil Diffuser combines technology and nature to entice the senses. Mom can listen to a tranquil playlist, watch 7 colorful LEDs blend, and inhale aromatic mists. It's the perfect gift to help Mom relax! Surprise your Mom with a unique gift that will not only delight her but will satisfy her sweet tooth! Baked Bouquet™ creates unique "bouquets of flowers" that are actually cupcakes! You can choose from Red Velvet, Strawberry, Vanilla and Chocolate cupcakes which are topped with delicious cream cheese buttercream frosting. The Mother Mia bouquet features beautiful purple roses that will remind your Mother of how much you love her on Mother's Day! Surprise your Mom with an assortment of truffles! Inside the cheerful Godiva Chocolate Flower Gift Box, Mom will find an assortment of individually wrapped dessert truffles in three scrumptious flavors: Dark Chocolate Lava, Milk Strawberry Cheesecake, and Crème Brulee. This is the perfect gift for a Mom with a sweet tooth. If your Mom loves wine, she will love ​VieVité Rosé! The Rosé offers a fresh and delicate aroma of cherries and strawberries with notes of spices to create a satisfying sensation on the palate. It is best paired with any grilled dish or any Mediterranean dishes! This is the perfect gift for a Mom who loves fine wine! ​If Mom loves sipping bubbly, she will love the Brooklyn BrewShop Sparkling Wine Kit! Mom can craft her own sparkling wine with this amazing kit! The kit includes everything needed to create five bottles of sparkling wine including specially sourced chardonnay grape juice from a premiere California vineyard! Mom will have fun making bubbly with her friends or it's the perfect gift to spend some quality time! Does your Mom love cheese? If she does, the ​Brooklyn BrewShop Italian Fresh Cheese Making Kit is the perfect gift! Mom can make the finest cheeses with this amazing kit! The kit includes equipment and ingredients to make mozzarella, burrata, ricotta and mascarpone cheese! In just one afternoon, Mom can make the best cheese board from scratch in the comfort of her own home! Best part of all she will share! For the Mom that loves to cook, ​4th & Heart Ghee Butter is a great gift. the Ghee Butter comes in a variety of flavors such as our favorites White Truffle Salt and California Garlic. The ghee is lactose-free and a healthier butter. It is a natural source of omega fatty acids, butyric acid, vitamin K, and medium/short-chain triglycerides. The ghee is perfect for use when cooking meat, pasta or veggies! With so many flavors you will surely find one that Mom will enjoy! For a Mom that is pregnant or wants healthier skin and nails the Zahler Prenatal DHA 300 is the perfect gift. The Complete prenatal multivitamin supplement includes 25 vitamins and nutrients plus 300mg of DHA. The vitamins have numerous benefits including premium nutrition for mother and child with optimal ratios and nutrients your developing baby requires in optimal ratios for absorption, metabolism and safety. If your Mom loves to relax with a cup of tea, she will love Harney & Sons Best Sellers! There are four tins per gift set, each with 20 sachets containing full leaf tea. The delicious set includes Paris which is a fruity black tea, Earl Grey Supreme which is a traditional flavored black tea, English Breakfast which is a black tea standard and Hot Cinnamon Spice which is their spicy best selling tea. Mom will enjoy the variety of caffeinated teas! For the Mom that enjoys cooking, The ​BLACK+DECKER Handiprep Express™ Kitchen System is the ultimate universal kitchen tool! The system replaces six different appliances and stores easily on a compact storage base! The 300-watt motor base controls each attachment, all Mom has to do is twist it into place and press the power button for easy operation. Attachments include: a potato masher, an immersion blender, a whisk, a food processor, and a mini chopper. The food processor comes with a slicing/shredding disk, a traditional S-blade, and an emulsifying disk. This system will save Mom time and kitchen space and make cooking more enjoyable! F​or the Mom that loves entertaining, the ​Ginkgo Charlie 20-Piece Service for 4 makes the perfect gift! The set feature a smooth and sleek modern shape in 18/10 stainless steel. The handles of the utensils concave on the back, giving them a comfortable grip, and allowing for easy stacking. This set makes a wonderful gift that Mom will enjoy! For the Mom that loves to cook, the Edge of Belgravia Precision Chef Knife Series is the perfect gift! The series comes with four different types of knifes to aid in making cooking effortless! The set includes a Paring Knife, Bread Knife, Deba Knife and Chef's Knife. The combination of bold design and the superb cutting capability of the stainless steel blades makes these knifes just as an effective cooking tool as a piece of art. These knives were designed for precision in cooking by Christian Bird and feature coated stainless steel and a non-stick blade coating. For the Mom that likes to entertain the Hampton Bay 3-Piece Square Tray Set in Galvanized Metal with Rope Handles is the perfect gift! This set of three decorative rectangular trays with rope handles in graduating size features beautiful styling in antique copper metal. Hand crafted by artisans, the rustic antique copper metal with rope motif accentuates these trays' distinctive allure. Give Mom the gift of music on the go with the vifa Helsinki Bluetooth Speaker! A petite, powerful bluetooth speaker, the speaker is crafted with carefully woven, Danish fabric designed to enable sound to permeate perfectly. The speaker features a powerful battery and a leather strap allowing Mom to bring music wherever she goes! If your Mom loves music, she will love the JBL Flip 3 Splashproof Bluetooth Speaker! The rugged rubber housing allows the speaker to outlast all of her adventures. She can connect up to 3 smartphones or tablets to the speaker and take turns playing surprisingly powerful, room-filling stereo sound - wirelessly! The speaker features a built-in rechargeable Li-ion battery to support up to 10 hours of playtime. Mom can also take crystal clear calls from the speaker with the touch of a button thanks to the noise and echo cancelling speakerphone. Splashproof means Mom doesn't have to worry about rain or spills! This is the perfect gift for a music loving Mom! For the Mom that doesn’t just love music but values sound quality, the Bluetooth® LG Tone Ultra are the perfect gift! Not only will she look stylish while listening, it will sound as if she’s in the recording studio! The headest features JBL Signature Sound that allows for more bass and Quad-Layer Speaker Technology for well-balanced sound in all bands. Compatible with Android and iOS devices, this headset gives more than half a day of listening time and will keep Mom rockin'! Crafted from anodized aluminum, the 13400mAh RazorPlatinum is not only the most powerful portable charger in the myCharge lineup but also the only charger capable of powering a laptop! The USB-C port delivers a 36W output and is able to fully charge a MacBook in 100 minutes. Charge any tablet, smartphone or other device via the RazorPlatinum's standard USB-A port. This is the perfect gift to keep your Mom's devices fully charged when she is on the go! Give Mom the power of capturing memories with the ​Polaroid Snap Touch instant digital camera! This innovative camera has the ability to snap, print, save and share all photos instantly with a special app and Bluetooth connectivity. The camera uses ZINK® Zero Ink technology for instantly printing photos, a 3.5 inch LCD touchscreen with 3 color modes and an option to print with the Polaroid Classic Border Logo. The 13 megapixel camera also has the ability to record HD video. The camera is the perfect gift for Mother's Day! Surprise Mom with gorgeous photos with the ​​Lomography Lomo’Instant Automat! Portable and automatic, this is the perfect companion for all of Mom's adventures! This camera automatically adjusts shutter speed, aperture and flash output to suit her surroundings, meaning that all she has to do is click a button! There's even a small remote for selfies! Mom will love this stylish camera and will bring it along on all of her adventures! For Mom's that love to decorate, ​the BLACK+DECKER MarkIT Picture Hanging Tool Kit makes it fast and easy to hang pictures and art! With MarkIT, Mom will hang every picture right the first time, with one tool and just one hole in the wall. With the built-in bubble level, Mom will get picture-perfect results every time. Works on single and dual mount frames and includes 30 fasteners. For the cocktail party loving Mom the Galvanized Metal Beverage Tub with Stand is a practical, versatile and decorative way to keep wine and other beverages chilled during a party! It features two handles and is light enough to carry easily when empty. The removable tray and bin allow for convenient tabletop usage! The set is great for parties or outdoor gatherings for a Mom that loves to entertain! Give Mom some time to herself while keeping baby occupied with the Tiny Love Gymini Kick and Play City Safari Mat! The mat provides endless entertainment featuring a Baby kick pad/tummy-time option, Easy-pull jitter tiger, Crinkly alligator, Engaging tummy-time mirror, Soothing sounds wind-chime, Hanging leaves teether, Rattle rings, Satin ribbons, Peekaboo crinkly widow and a Mat teether! The mat provides three modes of use which will provide Mom and Baby endless hours of play!